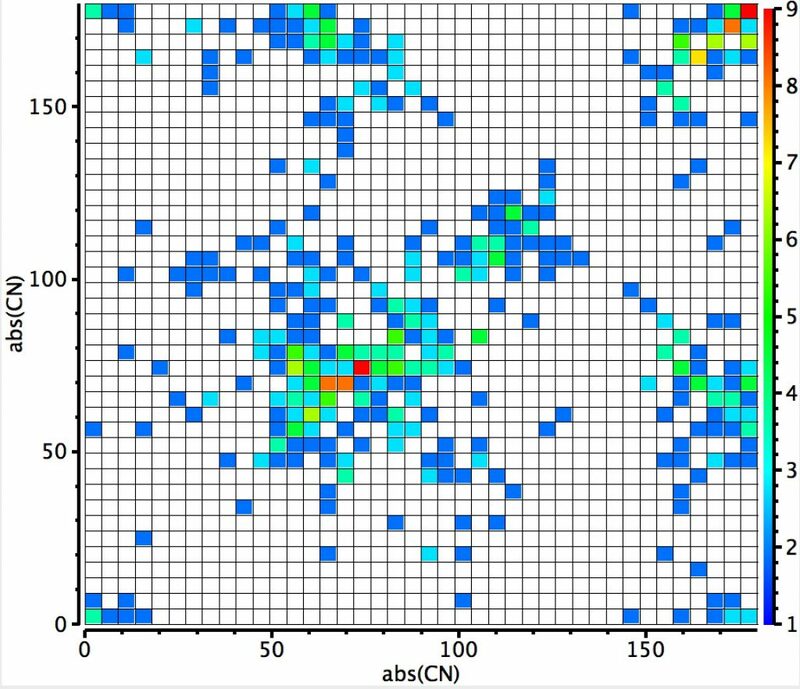 The plot below shows aminols, C(NHR)(OR”). 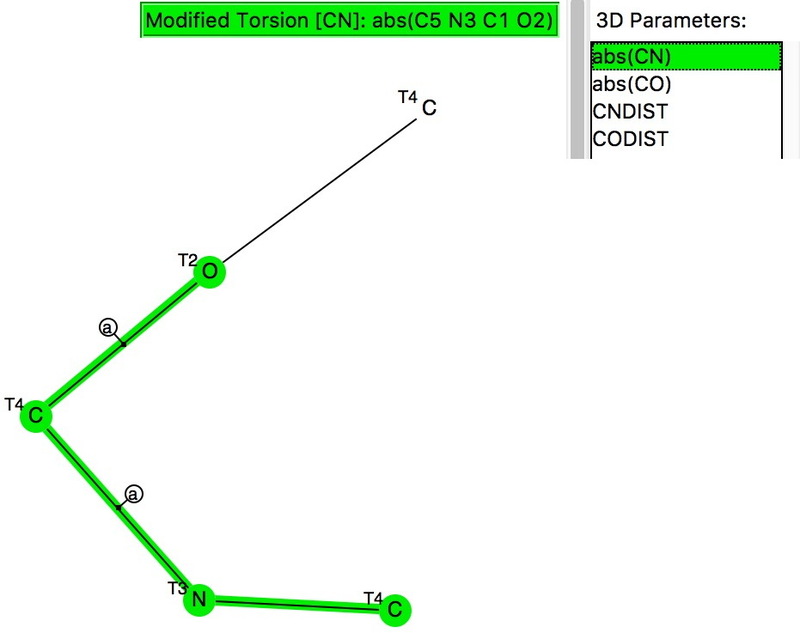 A torsion along either the C-O or C-N bond of ~60° implies that (at two coordinate oxygen or three coordinated nitrogen) there may be a lone pair with a torsion of 180°, which would set up an antiperiplanar alignment between that lone pair and the adjacent C-O or C-N bond (the anomeric effect). The clear hotspot is at angles of ~80°, which does raise the issue of why it deviates from 60°. Only a location of the lone pair centroid (using eg the ELF quantum mechanical technique) would cast light on that. There is a less distinct region for which the C-N torsion is 60° and the C-O torsion 180°, and an even less distinct region for the reverse (C-O torsion is 60° and the C-N torsion 180°). This tends to imply that a nitrogen lone pair is a better donor into a C-O bond than the reverse. Electronegativity suggests this should indeed be so, with the N lone pair less bound by the N nucleus and hence easier to release into a C-Oσ* orbital which is a better acceptor than then equivalent C-Nσ* orbital. This plot is where both heteroatoms are nitrogen (geminal diamines). There are about twice as many examples, resulting in more distinct clustering. 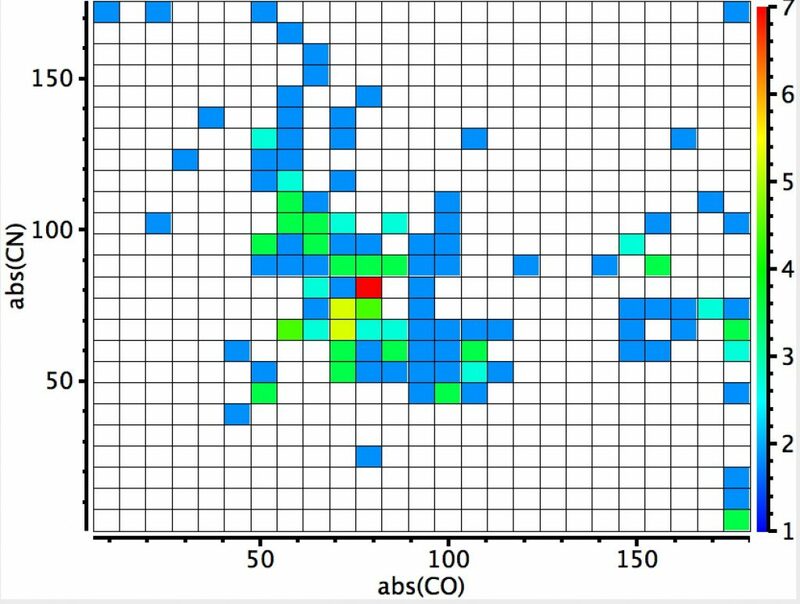 The anomeric hotspot is now around 70° and there are equally populated clusters where only one torsion is ~70°. There is another cluster for which both torsions are 180° (no stereoelectronic alignment of lone pairs) and three small clusters where the torsions are either 180° or 0°. There is finally an intriguing cluster for which both torsions at ~120° (again no stereoelectronics). Searches like this seem to be good at creating more questions than they answer. Clearly, the origins of the various hotspots need to be investigated, ideally using quantum mechanics to quantify the stereoelectronic interactions involved. So this sort of (ten minute) exercise is very good at raising research project investigations. This entry was posted on Friday, July 8th, 2016 at 11:05 am and is filed under crystal_structure_mining. You can follow any responses to this entry through the RSS 2.0 feed. You can leave a response, or trackback from your own site.